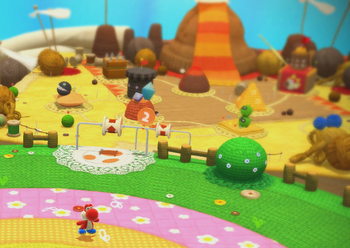 World 2 is the second world in Yoshi's Woolly World. It is a desert themed world. This world has nine levels: eight compulsory, and one optional special level unlocked after collecting all 40 Smiley Flowers for the world. Completing this world unlocks World 3. Across the Fluttering Dunes A level with many "waves" of sand and Piranha Plants. Duplicitous Delve A level with several Little Mousers, and the mechanic of switching sides of the level. Walk the Chomp to Unwind A level with lots of Chain Chomps, and puzzles involving them. Knot-Wing the Koopa's Fort A fortress level where Knot-Wing the Koopa is fought. Spiky Stroll A level with lots of spike pits. This is the first level where Poochy is introduced. Lava Scarves and Red-Hot Blarggs A volcano level with Blarggs. The Desert Pyramid Beckons! A maze-like level inside of a pyramid. Bunson the Hot Dog's Castle A castle level where Bunson the Hot Dog is fought. Perils of the Perplexing Pyramid Another level inside of a pyramid, with three different puzzles involving enemies. This page was last edited on July 21, 2018, at 10:15.